Offering you a complete choice of products which include acefylline, acefylline piperazine, choline theophyllinate and montelukast tartrate. 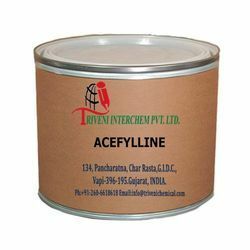 Acefylline (652-37-9) is white powder. It is also known as 1,3-Dimethylxanthine-7-Acetic Acid and Theophylline-7-Acetic Acid. It is use in Asthma and Emphysema Industry. Acefylline Piperazine (18428-63-2). It is use in Asthma and Emphysema Industry. Choline Theophyllinate (4499-40-5). It is also known as Oxtriphylline. It is use in Asthma, Bradycardia and Pulmonary Emphysema Industry. Montelukast Tartrate is powder. it is use in asthma and allergic rhinitis Industry.Montelukast Tartrate is powder. it is use in asthma and allergic rhinitis Industry. Looking for Asthmatic API ?